My family went to Miami last weekend and while we were primarily there to visit University of Miami, it was a vacation as well. Everyone in the family had something special they wanted to do in Miami. My son wanted to visit the university and experience Miami for the first time. My daughter wanted to swim in the ocean and play on the beach. My husband waned to eat Cuban food. And I wanted to find the best Key Lime Pie in Miami. Key Lime Pie is my favorite dessert, so I have very high standards. Although I order it whenever I see it on the menu, I am rarely impressed. Rarely does it taste as fresh as when I make it at home. I’ve had good Key Lime Pie, but I haven’t had spectacular Key Lime Pie at a restaurant. So even though the Miami area should have the best Key Lime Pie anywhere, honestly I didn’t expect much. After touring the university we drove around Coral Gables and Coconut Grove to let my son get a feel for the area. Near the CocoWalk shopping area, we came upon this happening beer and burger joint, Lokal. Specializing in locally sourced ingredients, Lokal had a fun neighborhood vibe and while I don’t eat red meat, there were non-beef options on the menu. My husband Yelped great burger reviews and, to my surprise, they were supposed to have a good Key Lime Pie. Always one to challenge another’s review, I ate my turkey burger, but I was really there for the Key Lime Pie. For the record, my husband and son really loved their burgers. According to them, the 50/50 – half beef, half bacon – was really a winner. Let me say again, that I did not have high expectations. I was going to eat it because I love Key Lime Pie, even mediocre Key Lime Pie. But WHOA! The Key Lime Pie at Lokal was amazing! Fresh, tart and creamy – just the way Key Lime Pie should be. The thick crust is made with graham crackers and crushed pecans. The pie is made with fresh-squeezed key limes and lime zest. And the whole thing is topped with freshly made whipped cream. Heaven. I don’t think I’ve tasted a better Key Lime Pie. My family tried to have a bite or two of my pie and they almost lost a finger. I at it slowly and savored every single bite. As delicious as the pie was at Lokal, it did not come up on any google searches for “the best key lime pie in Miami” – Joe’s Stone Crab held that distinction. Naturally, I had to test this theory before leaving Miami. We drove by Joe’s Take Away and got a few slices of Key Lime Pie to go. First of all, Joe’s did not have fresh whipped cream, it was sprayed from a can right in front of me. But the pie was good. I mean, if it had been the first pie I had eaten in Miami, I would have thought it was very good. But it did not compare to Lokal’s pie, not at all. 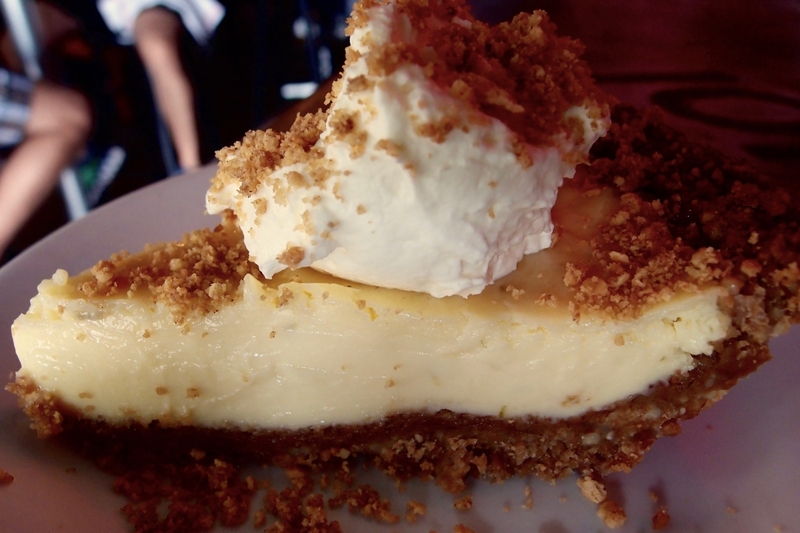 However, to have a real taste test we would have to taste Lokal’s Key Lime Pie again. It was only the fair thing to do. You know, for research. 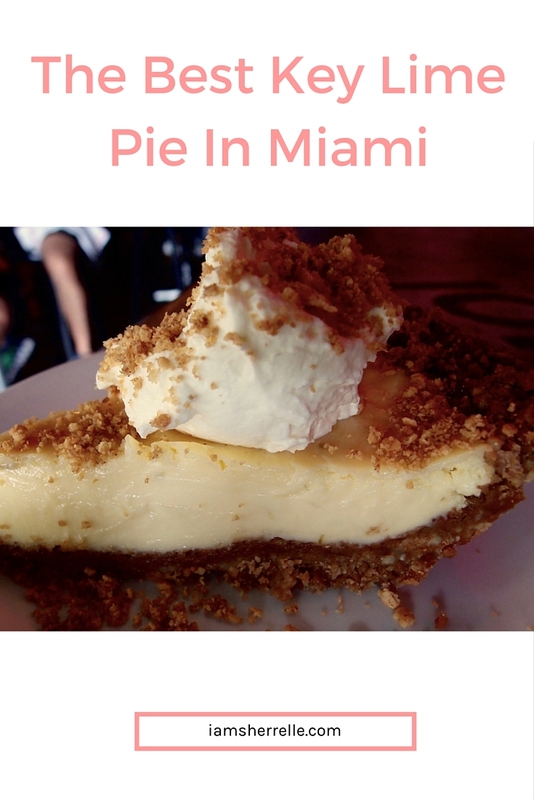 So we drove from Joe’s in South Beach to Lokal in Coconut Grove for lunch (and pie). This time I had the caesar salad with rock shrimp, but this was just an appetizer before my main course, pie. Two pieces of Key Lime Pie in one day was a bit much, even for me, but in the name of research it had to be done. Another piece of Lokal’s Key Lime Pie, and it was officially declared by everyone in my family: Lokal had the best Key Lime Pie in Miami. Meeting and talking to Lokal’s owner, Matthew Kuscher, we learned that Lokal had only been open a few months. That explains why the Key Lime Pie doesn’t have the press that it deserves yet. But it will, mark my words. You heard it first from Funkidivagirl, Key Lime Pie Connoisseur. If Matthew keeps the same commitment to freshness and quality to his Key Lime Pie that he has now, “the best Key Lime Pie in Miami” award isn’t far behind. I’m going to the Miami and Bahamas next week. I loveeeeeee key lime pie. I’m gonna try this place. Thanks for the review.